After winning a flag last season with the Western Bulldogs, Jenna Bruton faced an agonising choice. 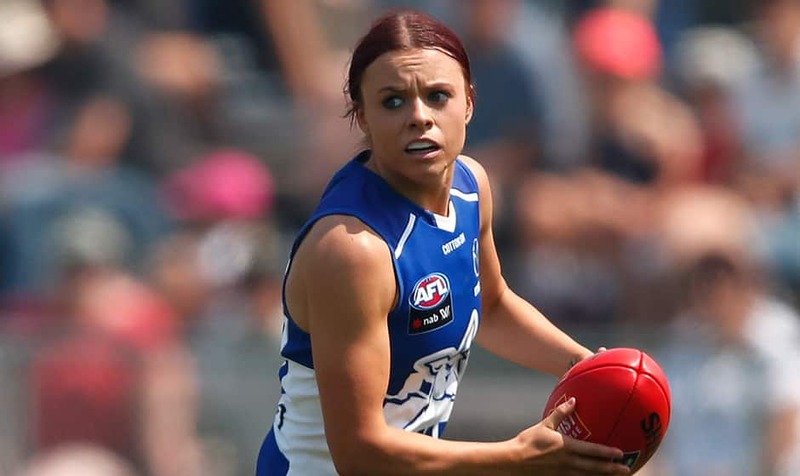 Expansion side North Melbourne was aggressively hunting talent as it prepared for its AFL Women's competition entry in 2019, and the Roos wanted the midfielder. The Dogs wanted to keep Bruton though, and her close relationship with coach Paul Groves made the decision to leave difficult. Ultimately though, North's offer was too good. "I was enjoying (being at) the Bulldogs, but I wasn't too sure what I was going to do," Bruton told womens.afl. "I did really like the team they were trying to build at North Melbourne, and the facilities. I just really liked the club and felt really comfortable. "It was nothing against the Bulldogs, I just felt like it was the right thing to do. "I'm glad I did it." Bruton should get the chance to take on her former side on Friday night at University of Tasmania Stadium in Launceston. Although she admitted to being a "bit nervous", she doesn't expect too much banter from the Dogs. "Everyone there’s pretty cool. I didn't leave on bad terms," she said. Bruton split time in the middle and up forward at the Dogs, but has played mainly in the midfield with the Kangaroos, averaging 18 disposals and 6.5 tackles in two games. Improving her fitness and diet has helped her spend more time as an onballer. The 23-year-old's speed and clean hands in congestion make her suited to the role. Her ongoing improvement is particularly impressive, considering the struggles her mother Suzy has endured. Having been diagnosed with an aggressive form of brain cancer three years ago, Suzy has been in hospital for the past 11 weeks, this time with a perforated bowel. Bruton has spent much of that time alongside her mum, barely giving her a chance to work at the family farm in the small town of Trentham, some 90km north-west of Melbourne. There are hopes Suzy can be out of hospital in the next fortnight but in the meantime, her family has ensured she can watch her daughter’s North Melbourne games not aired on free-to-air television via the AFLW Official App. "It gives her something to look forward to during the week," Bruton said.